Despite various international trade spats, the Baltic Dry Index (BDI) suggests a generally strong global economy with lots of commodities and products changing hands. And that’s good news for farmers at a time when agricultural commodity prices are struggling. Before we go too much farther, let’s explain exactly what the BDI is and why it’s considered a good economic indicator. In short, the BDI tracks and measures ocean shipping costs for various commodities; everything from grain to coal to steel. When the shipping business is brisk, rates of course begin to rise and that pushes the index higher. Thus, a rising – or falling – index tells us plenty about the state of international demand for commodities and broader economic conditions. To provide some perspective, the BDI reached an all-time high of 2330 points in December, 2013, a year during which corn traded above US$7, wheat around $8 and soybeans north of $15. Meanwhile, the BDI’s all-time low occurred in February 2016 at just 290 points. Not coincidentally, wheat traded as low as $3.60 during that same year, corn around $3.20 and soybeans at about $8.50. Now, the correlation between the DBI and commodity demand/prices isn’t entirely perfect. Shipping rates will also fluctuate according to such factors as the amount of available shipping capacity and there’s typically a lag between when shipping costs begin to rise or fall in response to demand. But overall, many economists still view the index as a bellwether of global economic health. For farmers – and all other producers of goods – a strong global economy is obviously a much better environment into which to sell their wares. So, what we are seeing today is encouraging. 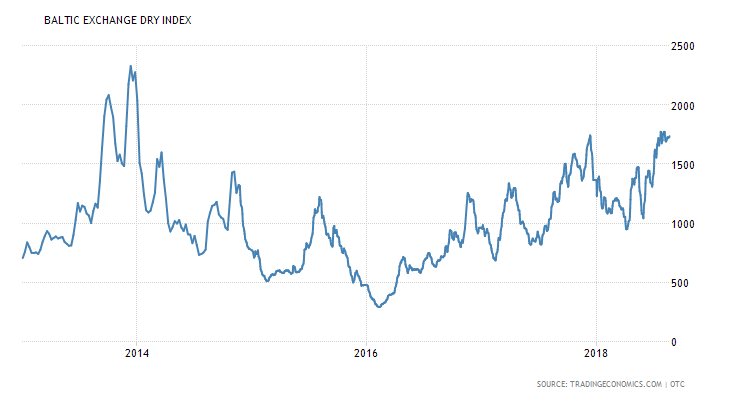 As the chart below shows, the index is currently running at its highest since 2014, with at least some of the more recent strength attributed to strong iron ore demand out of China. Of course, farmers would feel a whole lot better about export demand prospects if only China and the US could work out trade problems that have resulted in both sides implementing reciprocal tariffs against various goods, including a Chinese tax on imported American soybeans. If that could happen, the BDI would provide further reason for hope. The DePutter team integrates knowledge from various signs and signals and the BDI is one indicator we check on from time to time. For the latest marketing strategies that come forth as the result of our analysis, and for our comments on non-ag markets, try our weekly Market Advisory Newsletter. Make smart decisions for your farm. Copyright © 2017 DePutter Publishing.